As you walk around your garden, consider cultivating, here and there, some unusual plants. You’ll find that these specimens will soon become a beguiling focal point, attracting your senses with a visual feast or evocative fragrance. Such fun plants are great conversation starters when you are showing your flowers to family and friends. If you plant one or two unusual specimens per year, there will soon be lots to talk about as you stroll near the flower beds. 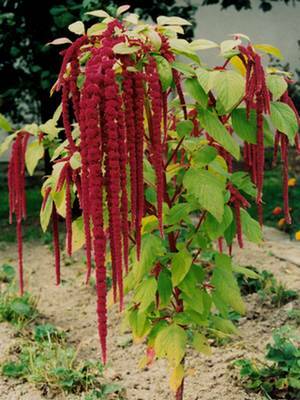 in the spring to grow this striking annual plant and you may not have to buy them again as Love Lies Bleeding self-sows quite readily. Choose a sunny spot and wait to find out how high your specimen will grow; some plants finish growing at two feet while others will grow taller than you are. The “flowers” of Love Lies Bleeding are long, hanging tassels of deep red, reddish-purple or vivid burgundy, all of which are spectacular in fresh or dried flower arrangements. Popular in Colonial times, and in Victorian English gardens, Love Lies Bleeding brings a touch of drama and romance to any garden. soil, salt, and drought conditions. With a passing resemblance to flowering thistle, sea holly produces a burr-shaped flower in shades of blue. The leaves and bracts vary from lacy to spiny. Check the seed package for height; some varieties only reach one to two feet, while others, particularly giant sea holly (Eryngium giganteum), can reach six or more feet. Since sea Holly grows a tap root, it can be hard to transplant; sow seed where you want the plant to grow permanently, then dead head flowers to keep self-sowing under control. Although this annual flower isn’t very dramatic to look at, and can be a challenge to grow in hot climates, it is the heady night-time scent produced by the flowers that entice gardeners to include it in their borders. After the last frost, sowing Evening Scented Stock Seeds in an established flower bed, in between other sturdy plants that can help support and disguise the somewhat spindly stalks, is one way to successful cultivation. Virginian Stock makes for a good companion, as both plants have similar growing habits. In most climates, grow Evening Scented Stocks as cool weather plants, similar to spring pansies. You may have to experiment a little to find the perfect micro-climate for these fragrant plants which bear small, four-petaled flowers in shades from purple to white. A sunny site with some shade, situated near your bedroom window, or beside a deck where you like to spend time in the evening, might be perfect. Mulch around the plants to keep the roots cool and the soil moist. There are two unusual qualities to this crocus – it blooms in the fall, from September to October, and it is also the source of saffron, the world’s most expensive spice. in containers, or tuck them in sunny to partly shady spaces in your rock garden, about three inches deep and the same distance apart. Thriving in average, well-drained soil and hardy in zones 5-9, the upright saffron flower grows about four inches high. The orange-red stigmas, which are the source of saffron, can be harvested once the plants are blooming.